ROCHESTER, N.Y. – Semrock has augmented its flagship BrightLine® family of fluorescence filters with a new series of high performance fluorescence filter sets that are specially optimized for laser excitation. Semrock's laser fluorescence filter sets are crafted for the most popular lasers used in fluorescence imaging, including the newer all-solid-state lasers that are rapidly replacing older gas-laser technology. The new excitation filters offer excellent transmission at the designated laser wavelengths, combined with low ripple passbands. The separation of the excitation and emission filters is exceptionally small (less than 2.5% of the longest laser wavelength) to enable maximum capture of even weak signals close to the laser line. The matched dichroic beamsplitters exhibit excellent laser reflection for all polarizations, and transition rapidly to a wide and low-ripple fluorescence passband, with the flatness, low autofluorescence, and surface cosmetic properties needed for excellent imaging performance. BrightLine Laser Fluorescence filter sets are designed for use in laser-scanning and spinning-disk confocal microscopes, as well as total-internal-reflection fluorescence (TIRF) microscopes. They are also ideal for any fluorescence microscope or imaging system that demands premium spectral performance and/or beamsplitter flatness, such as structured illumination systems for reduction of out-of-plane noise. "Laser-based fluorescence microscopy is the fastest growing segment of the fluorescence imaging market, and customers are demanding the performance and reliability that Semrock can offer," said Dr. Turan Erdogan, Semrock's Chief Technology Officer. Like all of Semrock's optical filters, the new laser fluorescence filter sets are exclusively manufactured with hard-coated Ion-Beam Sputtering technology for Semrock's famous "no burn-out" reliability, and they are confidently backed by an industry-leading five year warranty. These filter sets ship quickly from stock, as do an exceptionally diverse array of complementary fluorescence and laser-filter products. Semrock manufactures quality optical filters that set the standard in performance and reliability for the biotech and analytical instrumentation markets. 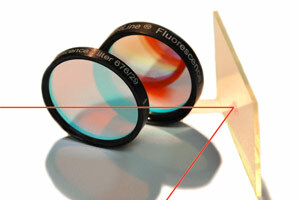 All Semrock optical filters are made with hard Ion Beam Sputtered optical coatings. OEM filters are manufactured in volume. End-users benefit from a wide selection of standard catalog products that ship from stock. Semrock's patented and patent-pending products include the highly acclaimed BrightLine® series of fluorescence filters for research and clinical microscopy, high-throughput screening, real-time PCR, and other fluorescence-based instrumentation; state-of-the-art filters for Raman spectroscopy; and other unique laser analytical instrumentation filters. Semrock's innovative products, made possible by combining modern ion-beam sputtering with Semrock's proprietary volume manufacturing technology, are covered under an industry-leading five-year warranty. BrightLine and Semrock are registered trademarks.